Guardian journalist George Monbiot wrote a damning critique of the BBC and Sir David Attenborough’s wildlife documentaries in late 2018, arguing that they do little to illustrate the huge environmental issues faced by the natural world. Since then, Attenborough has adopted a much stronger position. He spoke at both the UN Climate Summit and the World Economic Forum in Davos, and used his platform to highlight the threats of climate change. Embarking on a new collaboration, Attenborough and the BBC are set to confirm their position in a one-off documentary entitled Climate Change – The Facts, airing on April 18. The 90-minute film will explain the effects that climate change has already had and the disasters it might cause in future. Although it’s crucial to raise awareness among the public about the impacts and threats of climate change, it’s equally important to explain how to fight it. That’s something the BBC has been more quiet about. The recent series Blue Planet Live featured a segment on the Great Barrier Reef in which it stated that coral bleaching is the result of climate change. That places the BBC in line with the scientific consensus. The same episode later described the “heroic research” effort that is needed to save the world’s reefs from coral bleaching, and covered the capture and transfer of coral spawn to a new location. However, science has already given the solutions to address this problem. Recent reports from the Intergovernmental Panel on Climate Change, the Institute for Public Policy Research and some of our own research all clearly indicate that tackling climate change and other environmental issues – including biodiversity loss, soil erosion and even ocean plastic pollution – requires major changes to society. We need to revise our economic system and its dependence on growth to prevent the unnecessary consumption of the world’s resources. As the youth climate strikes leader, the 16-year-old Greta Thunberg, clearly puts it, we need “system change, not climate change”. In an era when schoolchildren are striking for climate action and radical proposals for climate action are entering the political mainstream, the BBC’s timidity towards even discussing solutions seems odd. Covering these arguments is political but goes way beyond party politics and certainly wouldn’t breach impartiality guidelines. Audiences might understand that this isn’t as interesting as coral spawning being captured during a lightning storm, as was shown on Blue Planet Live. But if the BBC don’t address the solutions to climate change, then how can there be an educated public which understands that saving the planet requires more than individual gestures like carrying a reusable coffee cup? There’s no doubt that Attenborough’s BBC documentaries have inspired millions of people around the world to take environmental issues seriously. His programmes have encouraged many of our students to undertake degrees in environmental sciences. Their insights into the natural world can present a sense of environmental optimism that promotes action. But failing to address the political and economic solutions necessary to stop climate change means the BBC could fail to respect its own values in education and citizenship. With their new documentary, Attenborough and the BBC should challenge our current economic system – only then can they fulfil their duty to inform the public with accuracy and impartiality. Cyber security incidents are gaining an increasingly high profile. In the past, these incidents may have been perceived primarily as a somewhat distant issue for organisations such as banks to deal with. But recent attacks such as the 2017 Wannacry incident, in which a cyber attack disabled the IT systems of many organisations including the NHS, demonstrates the real-life consequences that cyber attacks can have. These attacks are becoming increasingly sophisticated, using psychological manipulation as well as technology. Examples of this include phishing emails, some of which can be extremely convincing and credible. Such phishing emails have led to cyber security breaches at even the largest of technology companies, including Facebook and Google. To face these challenges, society needs cyber security professionals who can protect systems and mitigate damage. Yet the demand for qualified cyber security practitioners has quickly outpaced the supply, with three million unfilled cyber security posts worldwide. So it might come as a surprise that there is already an active population with a strong passion for cyber security – hackers. This is a term with many negative connotations. It evokes the stereotypical image of a teenage boy sat in a dark room, typing furiously as green text flies past on the computer monitor, often with the assumption that some criminal activity is taking place. The idea of including such individuals in helping build and protect cyber systems may seem counter intuitive. But – as we have highlighted in our recent research – the reality of hacking communities is more complex and nuanced than the stereotypes would suggest. Even the phrase “hacker” is contentious for many individuals who may be labelled hackers. This is because it has lost the original meaning: of someone who uses technology to solve a problem in an innovative manner. There are a growing number of online hacking communities – and regular offline meetings and conventions where hackers meet in person. One of the largest of these events is DEFCON, held every year in Las Vegas and attended by up to 20,000 people. These hacking communities and events are an important source of information for young people who are becoming involved in hacking, and may be the first contact they have with other hackers. On the surface, the conversations that are held on these forums often relate to sharing information. People seek advice on how to overcome different technical barriers in the hacking process. Assistance is given to those who are having difficulties – provided that they firstly demonstrate a willingness to learn. This reflects one of the characteristics of hacking communities, in that there is a culture of individuals demonstrating passion and the desire to overcome barriers. But such events are about more than sharing practical skills. As individuals, we are strongly influenced by those around us, often to a greater agree that we are aware of. This is especially the case when we are in a new environment and unsure of the social norms of the group. As such, these online and offline hacking communities also provide an important source of social identity to individuals. They learn what is and what is not acceptable behaviour, including the ethics and legality of hacking. Technological approaches alone cannot prevent cyber attacks. It is important to stress here that hacking is not an inherently illegal activity. There are many opportunities to engage in ethical hacking, which refers to attempting to hack systems for the purpose of finding and fixing the flaws that malicious hackers may try to exploit for criminal activity. Our research demonstrates that the majority of people active within hacking communities have no wish to exploit the flaws they find although they do believe that such flaws should be exposed so that they can be addressed – especially when the organisation concerned is holding public data and have sufficient resources that it is reasonable to feel they should not have any gaps in their cyber security in the first place. Several large and well-known companies actively engage with this culture, by offering hackers “bug bounties” – financial rewards for identifying and reporting previously undiscovered weaknesses in their systems. Of course criminal hacking does happen – and many of the people we have spoken to acknowledge that they take part in activities that are of questionable legality in order to achieve their goal of finding the flaws in a system. This creates a risk for those people, especially young adults, who are becoming involved in hacking. Through ignorance or through being wilfully misled, they may become involved in activities that result in them gaining a criminal record. If so, this impacts not only them as an individual but also the cyber security profession. As a result of this culture, many companies are being deprived of individuals who could have helped fill the increasingly urgent gap in cyber security professionals. To address both of these problems, we need to move past unhelpful and negative stereotypes and work with young people and hacking communities to provide an awareness of how their passion and skills can be used to address the cyber security challenges that society faces. In the UK 12-15% of pregnancies are complicated by high blood pressure. Specifically, pregnancy-induced hypertension (PIH) is high blood pressure that is diagnosed during the pregnancy and was not present before. Women with PIH normally return to having normal blood pressure within a few weeks of giving birth but during the pregnancy high blood pressure can cause many problems with women often having to spend extra time in hospital and having to be induced to give birth preterm. Researchers at BU are addressing this issue by seeking to design a new alternative drug-free treatment for high blood pressure. Slow and deep breathing has been shown to reduce blood pressure chronically when practiced daily over a period of 6-8 weeks in non-pregnant people who have high blood pressure. The Brythm App, using a graphic designed by a BU Student Research Assistant, uses bio-feedback to dynamically reduce the user’s breathing frequency to a personalised optimum. However, despite the research showing chronic adaptations from slow and deep breathing very little is known about the acute responses to slow and deep breathing. Therefore, the BU project started by characterising the short-term physiological effects of slow and deep breathing with women of childbearing age. With assistance from BU staff and student members, the first testing phase of the BU Brythm App was completed last year. The results show that there is an immediate physiological response in heart rate and blood pressure during just 5 minutes of slow and deep breathing. Specifically, this study allowed us to move forward in identifying the optimal breathing frequency which we believe can maximise the cardiovascular responses. Participants who took part last year will be pleased to know that future participants no longer need to undertake the inspiratory resistance protocol, where participants breathed through a Powerbreathe medic, as this was found not to elicit any additional benefit compared with the other slow and deep breathing protocols. The second testing phase for Brythm, as part of my PhD project, is to examine the short-term responses to slow and deep breathing within a pregnant population. This study will predominantly replicate the first study protocol to investigate whether the physiological changes caused by pregnancy influence the responses to slow and deep breathing. The aim of this study is to identify the optimal breathing frequency that will be used in the final study of my PhD. The final study will be an interventional study with pregnant women who have high blood pressure. They will use the Brythm App at home on their own devices for 10 minutes every day for a period of 8 weeks. The current study will investigate the physiological responses to multiple breathing frequencies; 4, 6 and 8 breaths per minute, and a dynamic breathing frequency controlled by an in-built algorithm. This may seem a low breathing frequency but your body compensates automatically by taking deeper breaths, and some participants feel so relaxed during the protocols they often nearly fall asleep. These protocols will be compared to spontaneous normal breathing and each protocol will be 5 minutes in duration. Heart rate and blood pressure will be monitored continuously to find the optimal breathing frequency for pregnant women, which maximises the physiological responses. Participation involves a one off session which takes place at the Lansdowne Campus and lasts for approximately 90 minutes. Participants will receive a £20 Amazon voucher as a thank you for their time. If you would like to participate, or know anyone who is currently pregnant who may want to take part, then please read the following inclusion and exclusion criteria and contact Malika Felton (mfelton@bournemouth.ac.uk & 01202 961845). More information can be found on the Brythm website (https://www.brythm.com/news/research/pregnancyresponses/). o An allergy/reaction to the gel used for ECG. Congratulations to the winners of 2019’s Research Photography Competition. This year marks the fifth year of our annual research photography competition. We received 25 submissions from BU academics and students. The research photography competition is an annual competition where staff and students at Bournemouth University are set the challenge to tell the story of their research through one individual photograph. This year centred around the theme of ‘place’ which could include anything from the place an individual’s research was carried out, to the place their research affected, to the place that inspired their work, to any other interpretation participants may have. 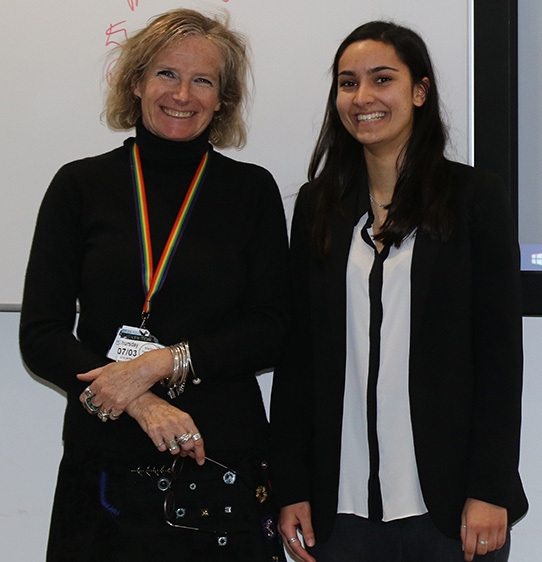 This year’s winner was announced in the new Atrium Art Gallery in Poole House, on Thursday 14th March, by Professor Tim McIntyre–Bhatty, Deputy Vice Chancellor. Post-feeding Blood pattern comprised of the artefacts of the blowfly Calliphora vicina enhanced with Bluestar. First prize was awarded to Christopher Dwen, a BU graduate and Demonstrator in the Faculty of Science and Technology. 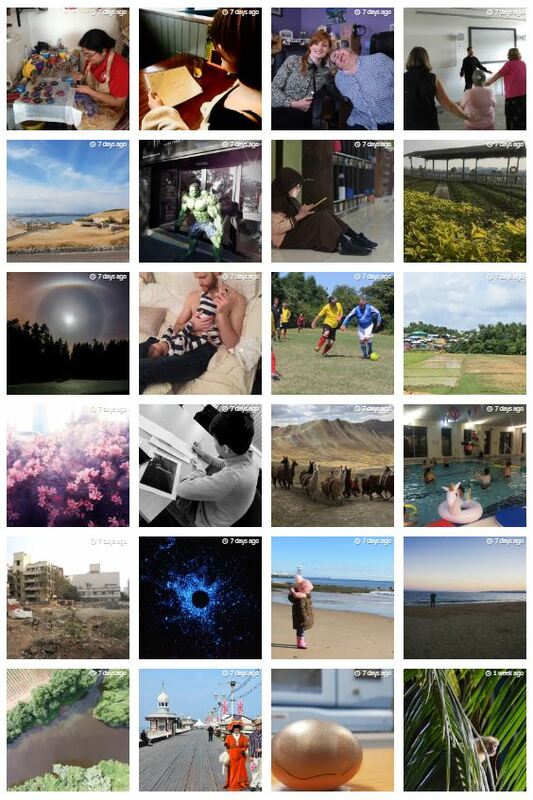 “I believe a photo can tell unspoken stories, that’s why I appreciate the photography competitions,” says Nurist. The photos are now displayed in the Atrium Art Gallery in an art exhibition and will stay up until the 28th March 2019. Be sure to go and have a look when passing by. It is a great way to see the creativity of our BU researchers, to learn about the research being undertaken, and to realise the diversity of research within BU. The English Premier League (EPL) is the most successful football league in the world and one of the most successful sports businesses of any kind. But the benefits may be relatively skewed towards people who live in London. Not only has the UK capital had more clubs per fan in the EPL than any other region since the league was created in the 1992/93 season, but their fans have to pay less to travel to see their clubs play away matches. Over the 26 years the league has been in operation, the number of EPL clubs based in London has remained relatively stable at approximately six. Meanwhile, the number of clubs from different regions has fluctuated. The largest reduction was observed in the north of England where the number of EPL clubs fell from ten out of 20 in 1995/96 (when the EPL was reduced from 22 to 20) to seven out of 20 in 2018/19. There was large variation in participation from teams in the Midlands or the east of England and a small increase in the number of clubs from the south and Wales, with the participation of Brighton & Hove Albion FC, AFC Bournemouth and Cardiff City in 2018/19. If you dig deeper, you can see that the northwest and, especially, Yorkshire & Humber are the biggest losers over time (Figure 2) – although Leeds United and Sheffield United are currently sitting pretty on the Championship (the second tier of English football) table and may well join the EPL in 2019/20. This implies that there may be stronger regional representation, with Huddersfield (Yorkshire) and Fulham (London) looking destined for relegation to the Championship. If you adjust this calculation for population size (assuming one club per approximately 2.5m people – distributing fairly 20 clubs across around 51m people), the north of England and London were – and still are – the only two regions punching above their weight. But you can also see a change over time as London has surpassed the north in terms of “over-representation” of clubs from the region. The north’s losses have benefited the south and Wales. Once again, drilling down into lower level regions, it becomes clear that the north-west is the only region comparable to London (Figure 3). For example, in the 2018/19 EPL season, there were six clubs from London (“observed”) and based on a population around 8,200,000 people from the 2011 Census we would expect around three clubs (“expected”). Meanwhile the north-west of England has a population of around 7.5m so, again, you would expect around three clubs – but there are five in the EPL. We decided to work out how much things were skewed in favour of London-based clubs and their fans. We calculated how much it costs for fans to follow their clubs on all away EPL fixtures, picking an arbitrary date: Saturday November 3, 2018. We used the most common kick-off time of 3pm and obtained rail and car travel estimates from Google maps and the national rail enquiries website. Unsurprisingly, following Newcastle United, in the northeast, was the most expensive choice – each committed Geordie had to spend around £2,500 on rail fares to attend all of the club’s away matches. Bournemouth, on the south coast of England, Cardiff City in Wales and Huddersfield Town in Yorkshire were next in line – their fans had to spend more than £1,700. At the other end of the scale, fans of London clubs such as Chelsea, Tottenham and Arsenal faced an average cost of around £1,000. Fans of Liverpool and Manchester clubs had to spend around £1,400 and £1,200, respectively. In total, rail fares for Newcastle United fans to attend all 19 away matches were in excess of £6.5m (accounting for away fan capacity and assuming sellout crowds). This is a clear outlier, reflecting Newcastle’s remoteness in relation to other clubs – although rail travel time for Novocastrians was better than expected. This at least reflects good services and connections – better than for Bournemouth, Cardiff and Burnley, for example, considering the distances. Rail costs per mile further demonstrate a variation – Leicester fans, in particular, have the right to feel particularly aggrieved, with cost per mile travelled to or from London being 0.58p and to or from everywhere else 0.52p (averages for all other cities/towns, excluding London, were 0.43p and 0.47p, respectively). Interesting point: for Bournemouth and Southampton fans, a return train ticket to London is slightly more expensive than for London-based fans travelling in the opposite direction. In reality, all these costs are underestimates, since televised matches are played at times that make the lives of travelling fans very difficult – it may be impossible to get a direct train and an overnight stay may be essential, further adding to the costs. And these additional costs are likely to be higher for non-London supporters, since services outside London tend to be less frequent, while overnight stays in London are more expensive. It becomes evident that football fans have to bear a disproportional cost in time and money, supporting an industry that makes massive profits. So, what can be done? Travelling fans are effectively sports “visitors” and should be treated with reciprocal respect, with more consideration given to televised matches and the distances fans have to travel. The EPL could also acknowledge the travelling costs for away fans and offer financial support to clubs in a similar way to how broadcast and central income is distributed. This would allow each club to consider a ticket pricing strategy for its own fans or support travelling arrangements. Perhaps clubs could consider selling a bundle product which would include both match and rail ticket. Alternatively (or in addition), the government or football institutions could negotiate fairer “fixed” rail prices. But it’s not all down to geography, as infrastructure also plays its part. London is at the centre of the biggest sports investments which have made the capital the natural host for national football events. It seems unfair that EFL (or Carabao) Cup finals and FA Cup semi-finals and finals are hosted in London. Wembley, the “headquarters” of English football, has historically been an integral part of the game in England and is recognised as a global football trademark. But always having cup finals there increases the time and expense for supporters of non-London clubs that are successful in these competitions. Perhaps the region of the finalists should be considered before a venue was decided. This imbalance is a problem for the EPL as it may have implications for its attractiveness and for generating revenue overall. And, as the so-called “people’s sport”, it’s surely a problem that this emphasis in favour of London and London-based clubs makes life harder for fans with less money to travel to see their clubs play. Football is one of the most loved sports in the UK and the world, bringing together families and friends over a number of generations. It’s a societal link of togetherness. It shouldn’t give an unfair advantage to London or lead loyal supporters to poverty. 2 days left to vote in this years Research Photography Competition! A reminder that voting is now live for this years research photography competition, and ends this Friday at 5pm! 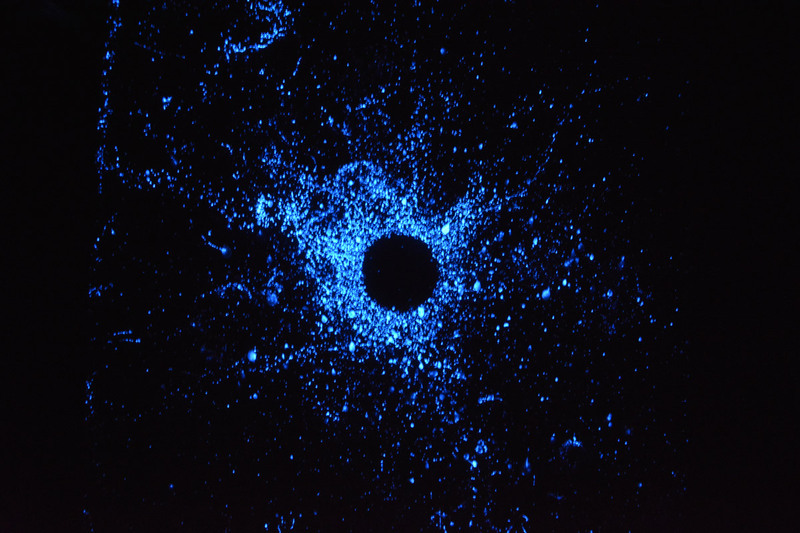 The research photography competition is an annual competition where staff and students are set the challenge of telling the story of their research in one single photograph. This years competition centres around the theme of place, which can range from the place an individuals research was carried out, to the place that inspired their research, to their own individual understanding and interpretation of what represents ‘place’. It’s up to you to decide who this year’s winners will be. Perhaps a particular image strikes you as interesting or the story behind the research captures your imagination – the choice is yours! You can find out the story and vote upon what captures you here. This year’s entries will be displayed in the Atrium Art Gallery in Poole House from mid March, with the winners announced on 14 March. You can book your free ticket to the prize giving here. 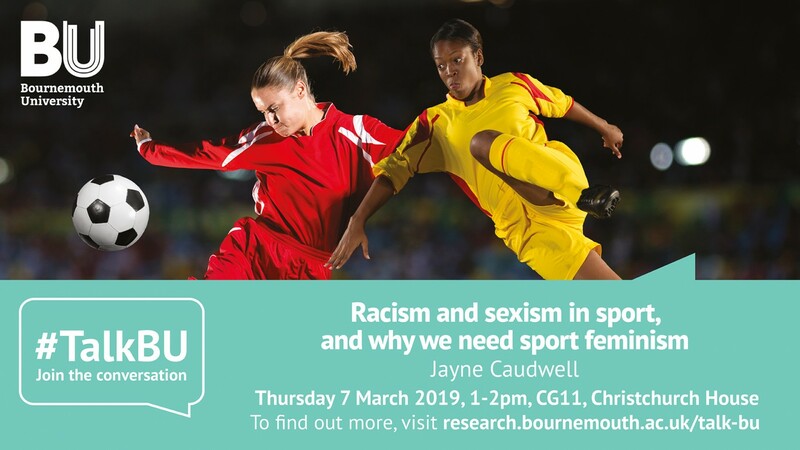 We will be joined by Jayne Caudwell at March’s #TalkBU session, who will be discussing racism and sexism in sport and why we need sport feminsim! A recent report identified that 40% of women in the sport industry face gender discrimination (Women in Sport, 2018). Black and minority ethnic (BME) sportswomen face increased levels of prejudice because of the dual effects of sexsim and racism. In this talk, Dr Jayne Caudwell will discuss the cases of UK footballer Eni Aluko and US tennis player Serena Williams, and the unjust treatment of these athletes to demonstrate the level of sexism and racism in contemporary sport culture. She will be referring to feminsim (theory and activism) in order to call out racism and sexism, and to explore how we can challenge oppression. Research photography competition voting is live! This year’s Research Photography Competition has focused on the theme of place – perhaps the place the research was carried out, a place which inspired research or a location that has been impacted by BU research. 20 images were submitted to the competition from across a wide range of disciplines. With all submissions now received we are excited to open up the voting for the winners to our staff, students and members of the public. You can vote either via our online voting system or via liking images on Bournemouth University’s Facebook page. It’s up to you to decide who this year’s winners will be. Perhaps a particular image strikes you as interesting or the story behind the research captures your imagination – the choice is yours! Voting will run until the 8 March 2019. Final call for research photography competition! The deadline for the research photography competition is tomorrow! 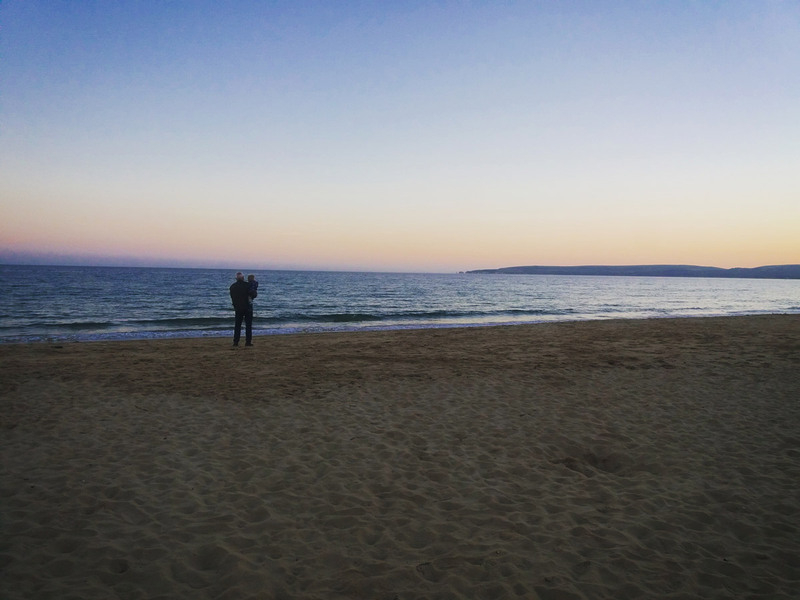 If you have a photo that tells a story of your research and represents the theme of place then be sure to email it over to research@bournemouth.ac.uk by the end of tomorrow! Get creative! The competition itself is set to be displayed in the atrium art gallery throughout the majority of March and so it is a nice opportunity for your research to be seen by those in the university! Be sure to submit your photos, with a 100-200 word blurb to research@bournemouth.ac.uk to be involved in the event. We have already had some really good submissions and would love for as many more people as possible to get involved! It is a really good opportunity to showcase your research in a more creative way! We look forward to the competition! The #SURE2019 deadline is fast approaching! The Showcasing Undergraduate Research Excellence conference is a really good opportunity for students to present their research to an audience and looks great on their CV opening up a range of opportunities in the future. 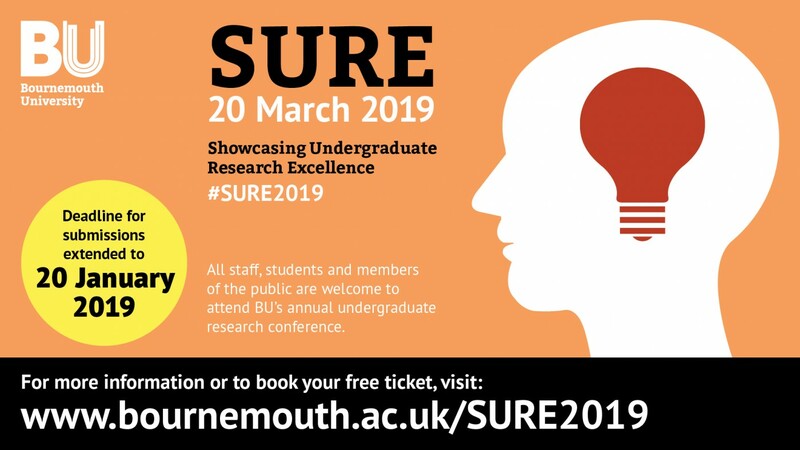 With the deadline being the 20th of January we ask that academics really encourage their students to submit their abstracts to sure@bournemouth.ac.uk. All undergraduate students at BU are eligible to apply, as are recent graduates. Examples of research could be anything from preparing for your dissertation or an essay, to work carried out during you placement year. to volunteering work or work with academic societies. The key criterion is to be able to evidence your own critical thinking through your work. We look forward to receiving more submissions! Extended deadline for the Research Photography Competition! The Research Photography Competition deadline is fast approaching! We have had some really good submissions so far and want to encourage more of you to get involved. We want to see you get creative! 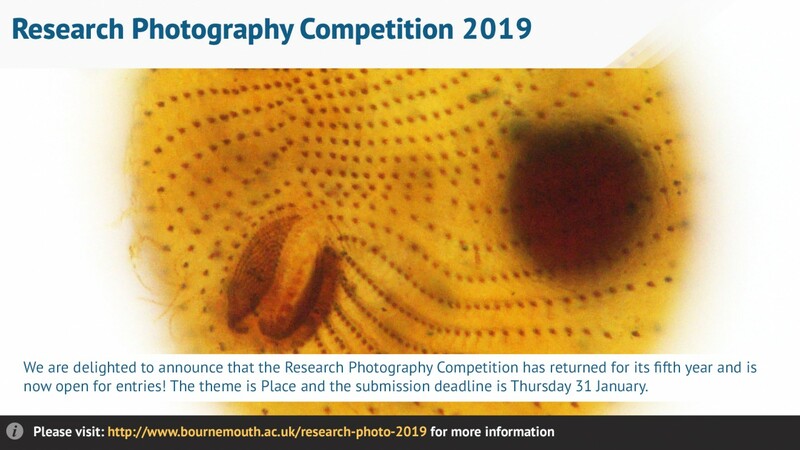 Send in your photo with a 100-200 word description to research@bournemouth.ac.uk by the 31st January 2019 to be a part of this year’s competition! The ‘100 Voices that made the BBC: Pioneering Women’ website was launched Saturday 1st December 2018, looking into the history of women’s involvement in the BBC, showcasing oral histories that have been recorded over the last 50 years but were never made publically available. 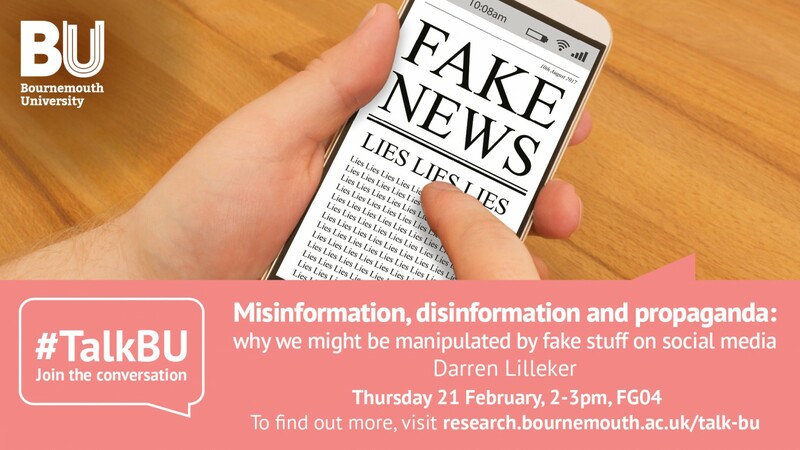 The content is produced, almost, exclusively by academics, including Bournemouth University’s Dr Kate Murphy, Principal Academic and Programme Leader of BU’s BA History course. Many great images, videos and archival documents can also be found on the website. Before teaching at BU, Dr Kate Murphy worked at the BBC for 24 years, primarily as a producer on Radio 4’s ‘Woman’s Hour’, alongside studying for her part-time PhD at Goldsmiths, University of London. Her doctoral thesis from 2011 was re-written as a book, titled ‘Behind the wireless: An early history of women at the BBC’ and published by Palgrave Macmillan in 2016. She is now heavily involved in the ‘Connected Histories of the BBC’ project. The ‘100 voices that made the BBC: Pioneering Women’ website is the fifth website created as part of the 5 year Arts and Humanities Research council (AHRC) funded project, headed by Professor David Hendy from the University of Sussex. The project is set to create a new digital catalogue of hundreds of rarely seen and heard audio and video interviews with former BBC staff and is linked to the forth coming centenary of the BBC in 2022. Dr Kate Murphy’s expertise in the history of the BBC as a result of her 24 years of work put her in good stead to help curate the content of the website. She has worked closely with Dr Jeannine Baker of Macquarie University in Sydney, Deputy Director of the Centre for Media History, which BU’s Centre for Media History has a close working relationship with. Together, they have produced the overall shape of the Pioneering Women project, with Dr Kate Murphy further writing and curating 4 of the ‘essays’ on the site; ‘Early Pioneers’, ‘Women’s Programmes’, ‘Equal Opportunities?’ and ‘In Control’ all providing a deeper look into women in the BBC and the opportunities they had access to. Furthermore, Dr Kate Murphy has produced a research blog for BBC History, connected to the work she has undertaken on the Pioneering Women website. The blog places focus on Isa Benzie and Janet Quigley, the two women who ran the BBC’s Foreign Department for a large proportion of the 1930s. The blog can be accessed here. Museums are often perceived as dusty cabinets full off dead and ancient things, especially those institutions you’ve never heard off. You know the ones, the neglected pride of county towns that could play a vital cultural and social role but struggle for funding. For some, technology is the answer, virtually recreating museums and their contents online, or launching fancy augmented reality smartphone apps that overlay videos of the real world with interactive computer-generated content. We certainly see the potential for such apps to make museums more exciting, especially to young people, and have recently been using them to bring dinosaurs to life. But sadly our experience suggests visitors just aren’t keen on downloading these apps. So is there another way technology can help revitalise musuems and similar attractions? We are working on a project called PalaeoGo! that explores how museums and parks can be enhanced by augmented reality, 3D digitisation and new search engines. Our first foray with augmented reality was at White Sands National Monument in New Mexico, US, using a smartphone app called Zappar to support research undertaken there. Using the phone’s camera to scan a code on a notice board or flyer brings forward a 2D computer-generated image superimposed on the phone’s live camera feed. Users can see a troop of mammoths walk over the horizon with the real landscape behind, or have their selfies taken with a mammoth. We’ve since created our own free app that recreates augmented reality dinosaurs and other extinct reptiles and mammals in 3D, without the need to scan a code. We deployed the mammoth and a T. rex at various events in 2017 and 2018, allowing visitors to pose for selfies. The tech was embraced enthusiastically, not just by children but by older generations as well. We found the sense of technological wonder coupled with a chance to strike a silly pose with an extinct animal really appealed to the visitors. But when we first deployed the app at a museum, in summer 2018 at the Etches Collection on Dorset’s Jurassic Coast, it challenged our thinking. In fact, it stopped us dead. When we had staff on site to show people what was possible with our own tablets and phones, the technology had an impact and people were excited to see it in action (although they did not always download the app). But no one engaged when we relied on posters and banners to encourage visitors to download and use the app. We failed at the first step, not due to a lack of interest in the technology or in the 3D dinosaurs deployed, but due to the fundamental reluctance of visitors to download museum apps. 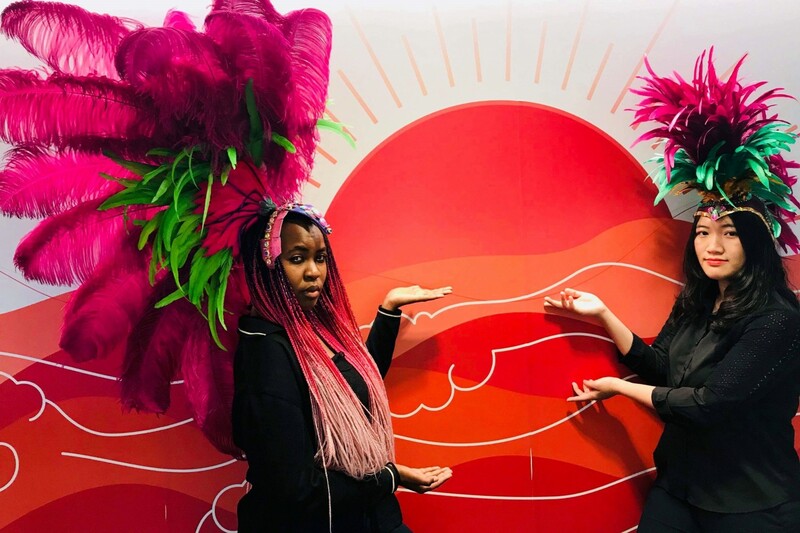 We have since found this experience to be shared by others, such as Skybox Museum, who also struggle to get visitors to download their app deployed at their site in Manchester. In fact, the feedback we’ve received so far suggests that simply getting people to download a museum app, rather than a problem with the underlying technology, is the biggest obstacle to its success. What makes people download apps? To find out why, we immersed ourselves in a growing body of consumer-based research on smartphone apps. It turns out that the characteristics of an app are less important when it comes to getting people to download it than whether they trust the makers, and that brand loyalty and familiarity help build this trust. We also know that the potential for social interaction and pure enjoyment are more important than the usefulness or educational value of an app. People want to be entertained, engage with others and are wary of potential risks to their phones and personal data. So when you’re asked to download an app at the doors of a museum, the default position is to decline. It’s a hard sell, especially if you have children in tow. Promoting the app in advance helps but, even if you overcome this reluctance, people still want a guarantee of fun. Not enough for a download. What’s the answer? Games are an obvious possibility. Which regular museum visitor hasn’t seen a horde of children with clipboards on some form of quest or hunt? Promising a fun game is perhaps the key to getting children to try the augmented reality we know can change a museum experience. The alternative is to make such resources available without an app, and we are exploring this. One solution might be to enable visitors to access it through their phone’s internet browser or via a standard QR code. Another idea we are trialling is to preload the technology onto a tablet hired like an audio guide at a museum’s entrance. As the software doesn’t need downloading it can be more complex, for example using locational technology such as GPS that can prompt the user to activate the device at a given spot and offer content tailored to their visit. But this would make social interaction and downloading those fun-filled selfies harder. We believe that technology has much to offer the museums of the future. In fact, we would argue it’s essential to their survival. In particular, mixed reality, a form of enhanced augmented reality where real people and objects are displayed in virtual worlds, has some exciting potential to create immersive, engaging and educational content. But for once, the smartphone may not hold the key. Being able to understand the characteristics and behaviours of different types of personality can help you understand the people you are interacting with, as well as yourself. 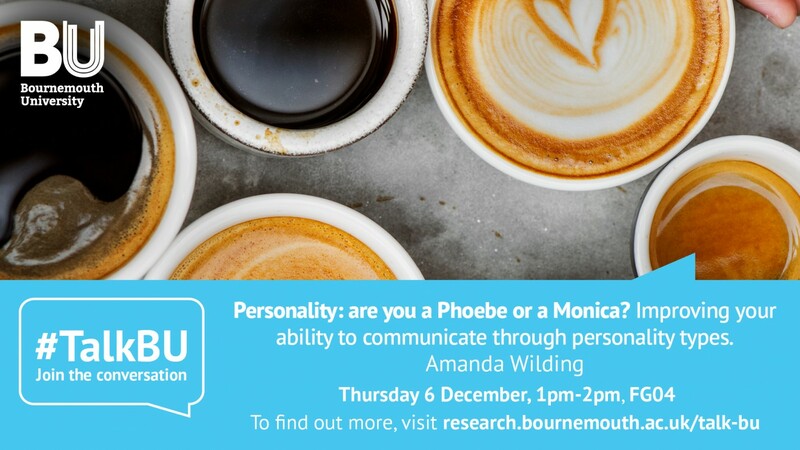 Join us in the exploration of personality profiles, using Jelly Babies to help change the way you view people.